Yolande Harris is an artist and scholar engaged with sound, its image and its role in relating humans and their technologies to the environment. 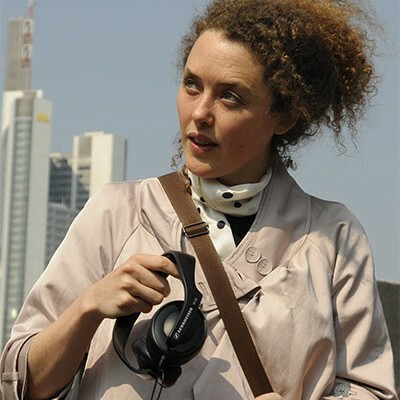 Her artistic research projects consider techniques of navigation, sonification of data, sound worlds outside the human hearing range, and underwater bioacoustics. They take the form of audio-visual installations and performances, instruments, walks, performative lectures and writings. She weaves together her artwork with her theories of techno-intuition and sonic consciousness, in which expanded forms of awareness emerge through technological media and critical listening techniques. Her work is presented internationally in the context of visual art exhibitions, music venues and media art festivals and conferences. These include: MACBA Barcelona, Schirn Kunsthalle Frankfurt, ICA London, Netherlands Media Art Institute Amsterdam, ISEA, Issue Project Room NYC, Shedhalle Zurich, STEIM Amsterdam, Ear to the Earth Festival NYC, WRO Media Art Biennale Poland, House of World Cultures Berlin and Sonic Acts Festival Amsterdam. Her series Taking Soundings (2006-8) explores historic, contemporary and animal navigations using sound; Sun Run Sun: On Sonic Navigations (2008-2010) expands this into instruments and installations exploring the sonification of GPS data; and Scorescapes (2009-2012) examines relationships between sound and place, especially in underwater environments. Her current project Listening to the Distance (2014), commissioned for a solo exhibition at Woodbury Art Museum Utah, explores relationships between ocean and desert environments. Yolande, Assistant Professor in Film/Animation/Video at Rhode Island School of Design (RISD), teaching courses in Open Media, Video Installation and Intermediate Video. Prior to this she was Artist in Residence at DXARTS (Center for Digital Art and Experimental Media) University of Washington, Seattle, where she developed and led a graduate seminar ‘Art and Environment’. She is the recipient of two multi-year individual artist stipends from the Netherlands Mondriaan Fonds, was Research Fellow at Orpheus Research Center in Music (ORCiM) Ghent, Artist in Residence at the Netherlands Media Art Institute and STEIM in Amsterdam, Visiting Fellow in Sound Art at the Academy of Media Arts Cologne (KHM), and Artist Researcher at the Jan Van Eyck Academy. Yolande was Lecturer in Interaction Design at the Technical University of Eindhoven and is regularly invited as Visiting Lecturer at art and design colleges in Europe and the US.